Is there anything Canberrans like talking about more than Public Art? Well there’s bicycles, maybe dogs.. Cats.. But after that, definitely public art. ArtsACT has added an ACT Public Art Database page to their website. 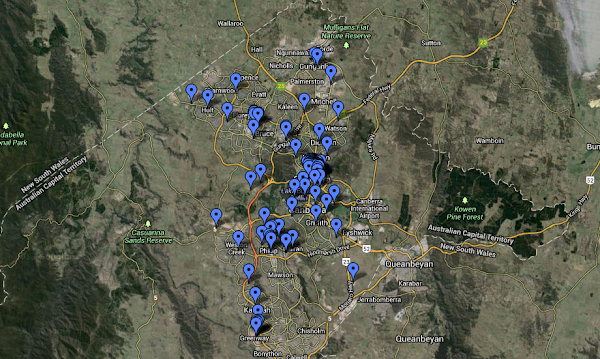 It pushes through to a very handy Google Map. Now you can be sure you’ve checked out all the Art. So you can have a fully informed opinion. This one, “Soccer Players” gets me every time I drive by. I see a group of kids out of the corner of my eye. I don’t know if it makes me more, or less, attentive, but it is certainly something. It’s a bit rubbish. Just like the”art”. So close and yet… Why on earth doesn’t the Google Maps/Earth layer include a link to the descriptions of the artwork?!? Nice idea, I’m going on a tour.